Ex-England seamer Steve Harmison thinks Durham's Ben Stokes has a good chance of playing in the second Ashes Test. All-rounder Stokes is unlikely to be selected for Thursday's opener in Brisbane as England are expected to use an orthodox four-man bowling attack. The wicket at Adelaide, the venue for the second fixture, has a reputation for being flat and high-scoring. "For that pitch, I think there's a spot up for grabs to have a fifth bowler and Ben is that player," said Harmison. Uncapped at Test level, New Zealand-born Stokes has played 14 limited overs matches for England. "It would be good to see him get some action and Adelaide is his best chance," Harmison, a team-mate of Stokes's at Durham until he retired at the end of the season, told BBC Newcastle. "I think the England selectors will be looking there and at Sydney [for the fifth match] in terms of potentially taking a batsman out of the side. "At Sydney it's kind of tradition to play a second spinner so Ben may well come into the reckoning there too and Ben has shown he can take wickets at international level." As a part of Stokes took 42 wickets at an average of 26.57 and contributed 615 runs batting in the middle-order. Ben Stokes' father, Ged played international rugby league for New Zealand. The family moved to England in 2003 when Ged became coach of Championship side Workington. 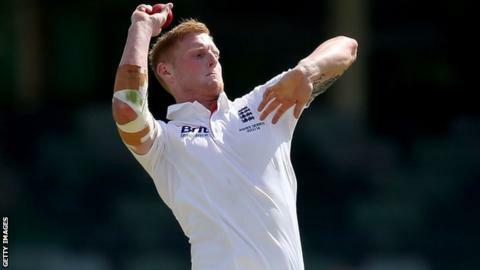 Prior to 22-year-old Stokes had not been included in an England Test match squad. "Going on an Ashes tour is just fantastic and I am sure he will grasp the opportunity with both hands," added Harmison. "Even if the only action he gets is as 12th man, it'll be a great experience and we in the North East should be proud to have him out there."